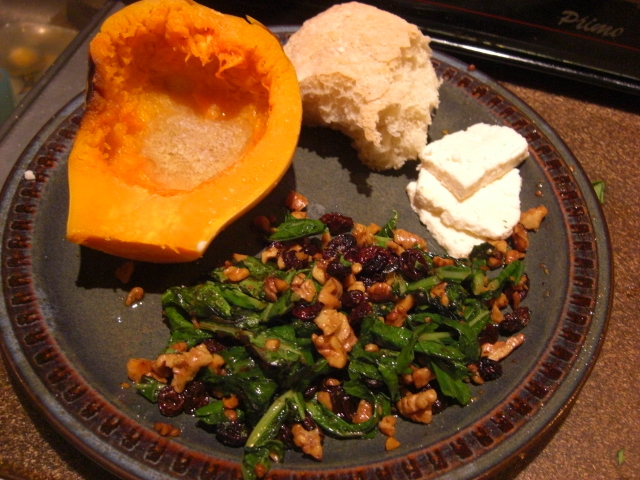 Here are some (possibly) interesting things that happened in my kitchen this week. I’ll admit I’ve never been a fan of Southern cooking. Since I’ve been married, I’ve been dragged drug to too many meat-and-threes with mushy, overcooked vegetables. But I’m learning to do a lot better by my CSA veggies. Check out this supper from last Sunday. 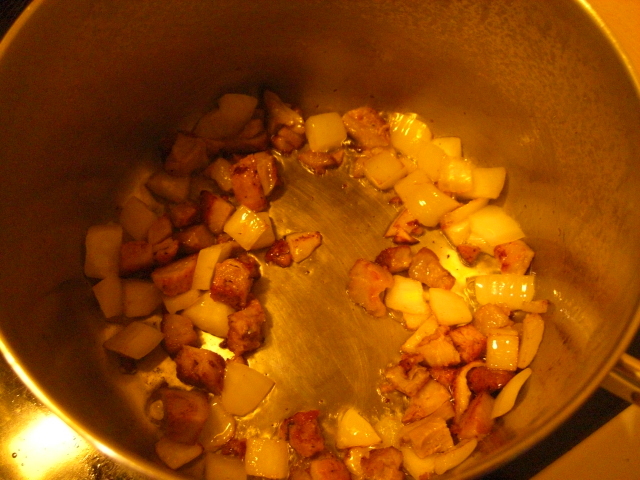 For the green beans, I started with a scrap of leftover pork chop and browned it with some onion. Then I added the beans and cooked them on low for about 20 minutes. The pork made the beans great, but it absolutely ruined the pork. Bizarrely, utterly tasteless. Guess that’s why people use ham hocks. Lesson learned: whatever pork you use to flavor Southern-style green beans, take it out before serving. 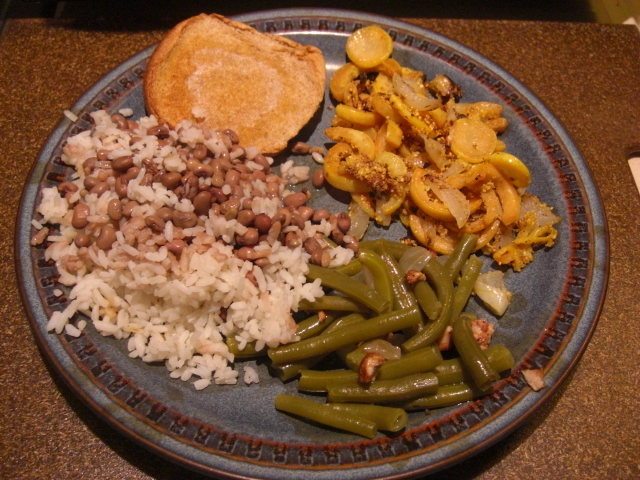 The squash was an all-CSA affair. 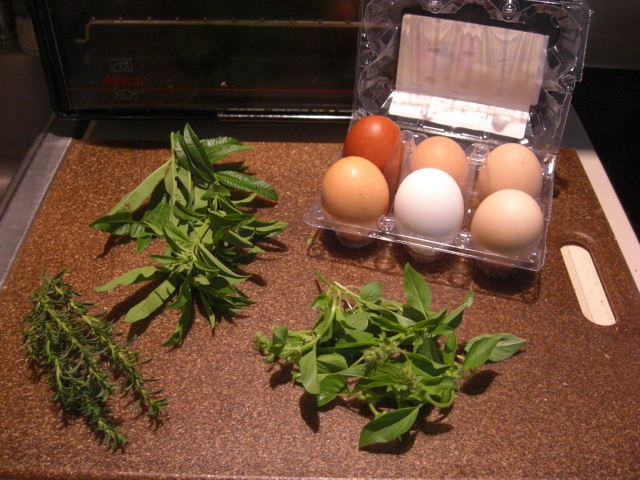 Savory is an awesome herb with a delicious flavor that’s kind of peppery. You know how people tell you to cut back on salt by using more herbs? And how you look at them like they’re nuts? With savory, it might just work. Plus, its thin leaves last in the fridge far longer than most herbs. No need to put them in water, even. 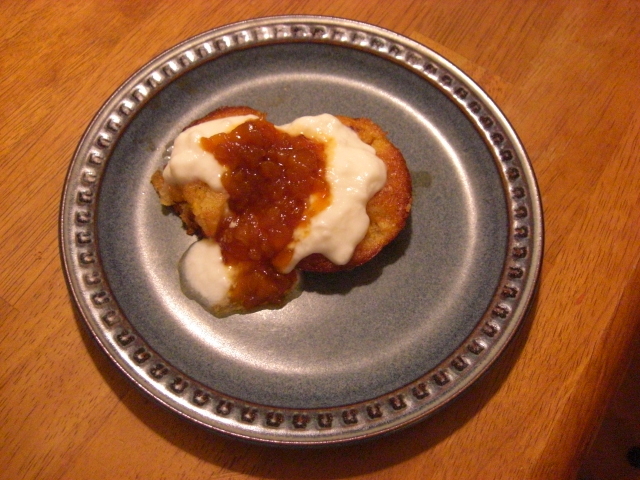 We finished off supper with nectarine mini-cobblers topped with yogurt and brandy-nectarine sauce. You know the rule: anything you put yogurt on is health food. 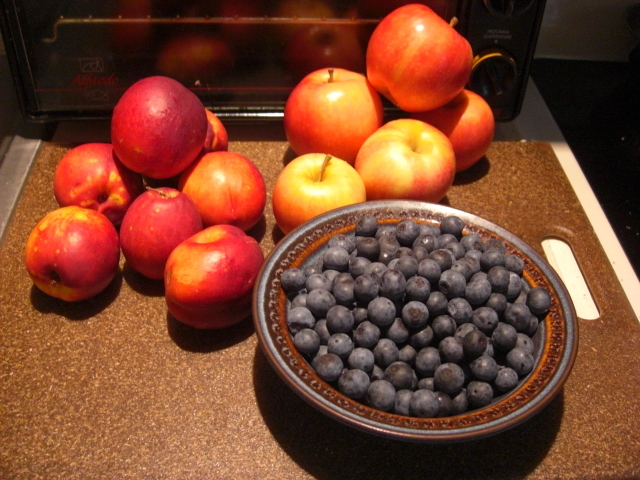 In this week’s box was more fruit and other yummy things. The green beans had some caked-on red clay (definitely local beans! ), so I soaked them in some warm saltwater, rinsed them, dried them, and put them back in their bag. No scrubbing required. I’m drinking a terrific cup of lemon verbena-lime basil tea right now. I steeped 4 crushed verbena leaves plus the top of one of the lime basil stems in 2 cups of boiling water for 5 minutes. It’s even a little strong. Next time, I’ll use 2 lemon verbena leaves and let it steep longer. I’m stingy with the verbena because it dries so perfectly. No rush using it. The winter savory should be good for awhile, too. 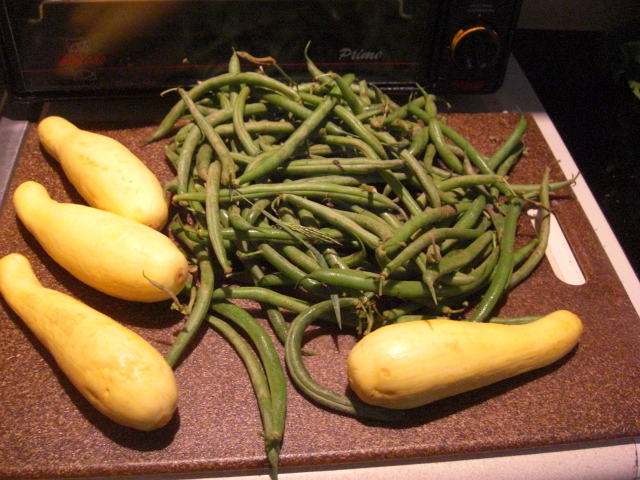 I’m planning on throwing some in the green beans and in fresh cowpeas I scored this weekend. The lime basil must be seen to more quickly than the other two. 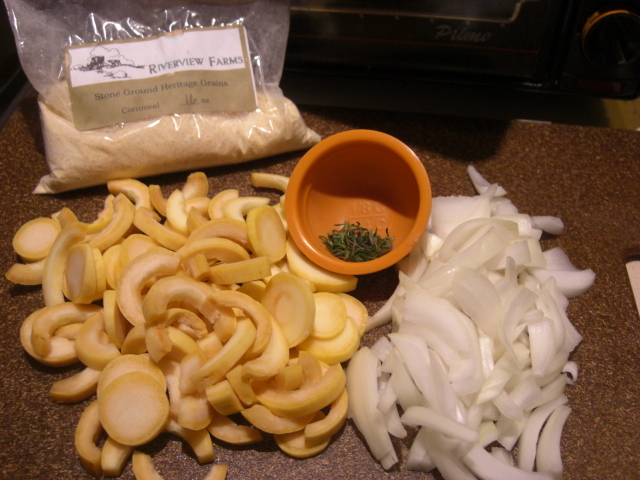 I’m going to take Fran’s recommendation and add some to the yellow squash. I’m also planning a lemony shrimp dish tomorrow evening, and the lime basil should be dreamy with that. Whatever’s left will make more tea! I’m headed out to supper tonight, and Chris and James are staying in and feasting on two stuffed pork chops (Thanks, Lucy!) 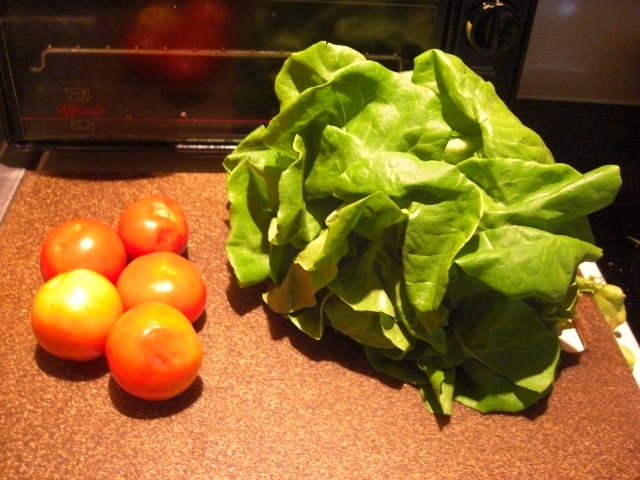 and a salad made with this week’s beautiful lettuce and sliced tomatoes. It’s not 4th & Swift, but I think they’ll be happy. Wow! 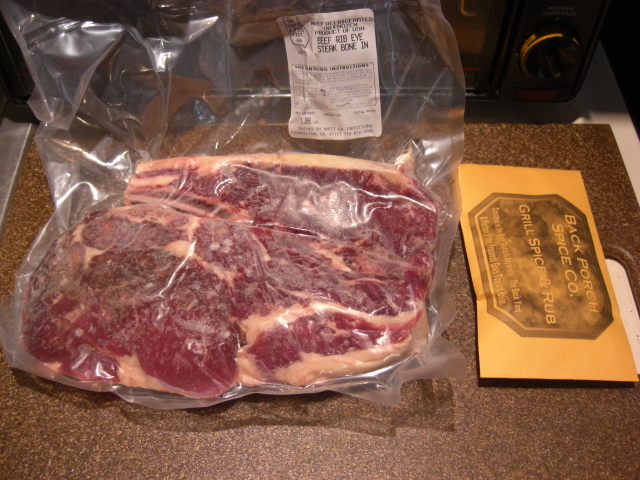 Ribeye – what a treat! I’ve never cooked ribeye before, but a little googling points to pan searing it and then cooking it on a lower heat. Sounds simple and delicious! Maybe use the spice rub on it, too. Don’t think I’ll get to it this week, so in the freezer it goes. But not for long. I also ordered a few things from the online store. 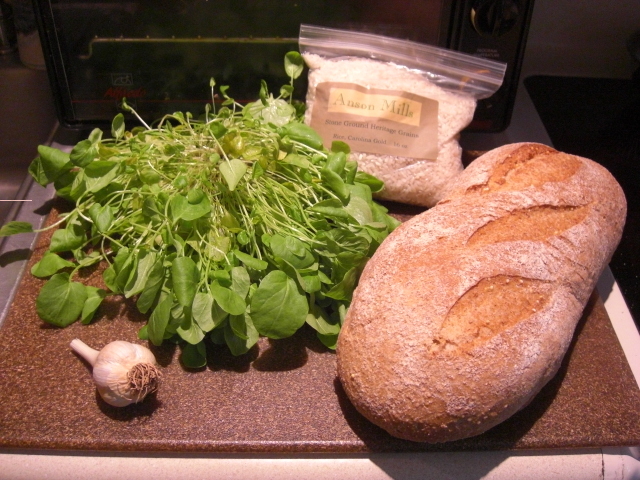 Watercress is a pain to deal with, but I like the taste. I’m going to chop it up and make a spread with cream cheese and a little bleu cheese and serve it on crackers for light lunches along with beautiful apples. 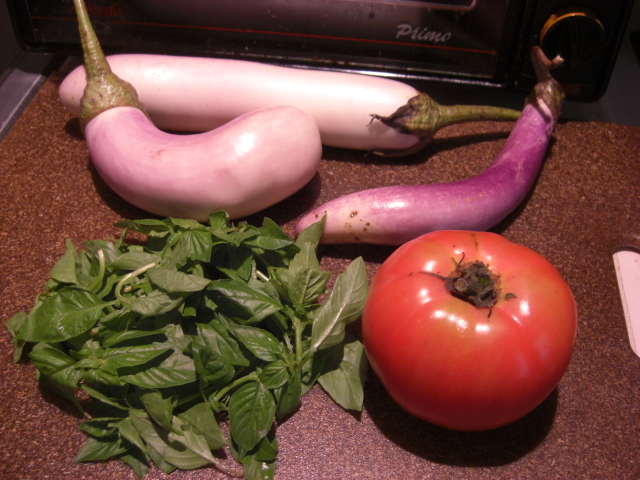 This eggplant recipe is great. Sour cream subs in for goat cheese just fine, and any fresh herbs will do. 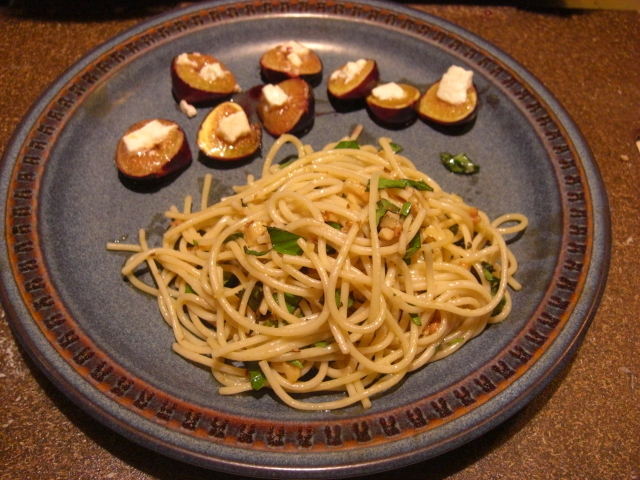 The honey part of the vinaigrette is not necessary when using Asian eggplant. In fact, I think it detracts a little bit. 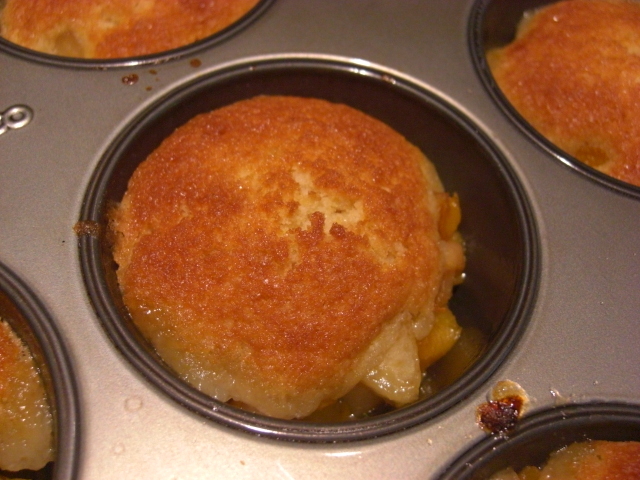 Mini-peach/plum cobblers are a big hit. The recipe’s a snap once you’ve done it a couple of times, and I think the cobblers get even better after they’ve sat in the fridge a few days. Now that’s a winning recipe. The homemade lye soap is doing nice things for my complexion. Whole chickens take forever to defrost in the refrigerator. Overnight does not cut it. 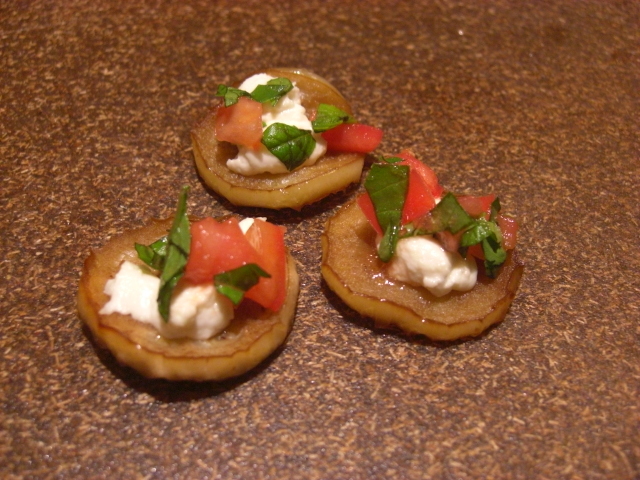 Last night, Chris and I had a supper of broiled eggplant with goat cheese, fresh tomato, and basil. 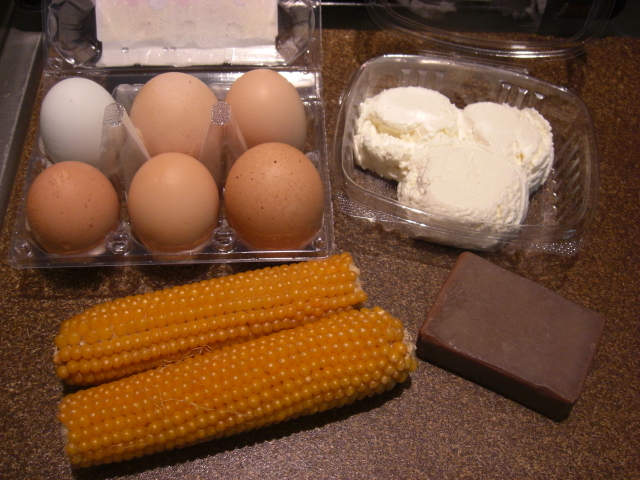 I followed this recipe except I cut ¼ inch instead of ¾ inch rounds (whoops!) and used basil in place of all the other herbs. 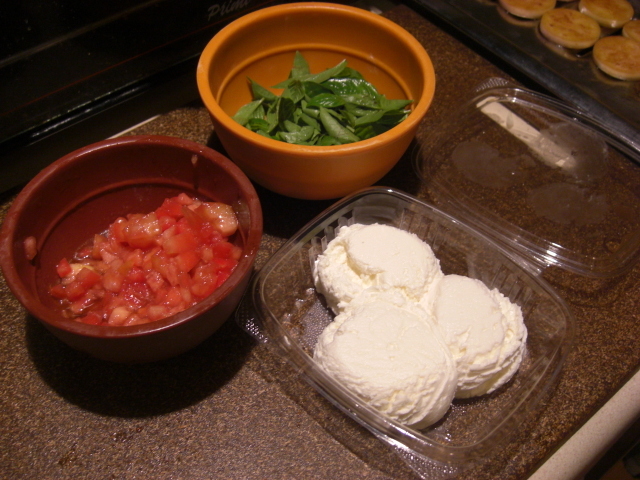 Tomato, basil, and goat cheese - oh, my! For a few weeks, I made peach muffins with the beautiful peaches from my CSA share. (Chris and I aren’t big fans of the fresh peach.) But then I started getting a hankering for cobbler. I wanted to combine the convenience of muffins with the yumminess of cobbler. After browsing through some recipes, I didn’t see any reason one couldn’t make muffin-sized mini-cobblers. This week, I finally did it. 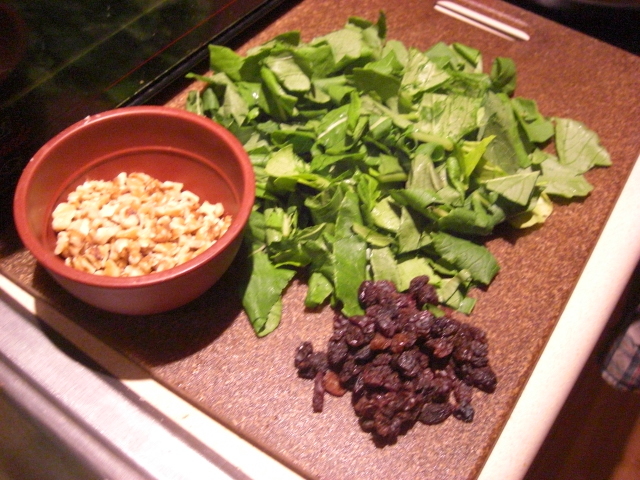 Mustard greens with raisins and walnuts is as good as kale with raisins and pine nuts. One of my favorite recipes is kale with raisins and pine nuts. I’m thrilled to report that this recipe works just as well with mustard greens, raisins, and walnuts. I had planned just to sub in mustard greens for kale but then found I didn’t have any pine nuts. 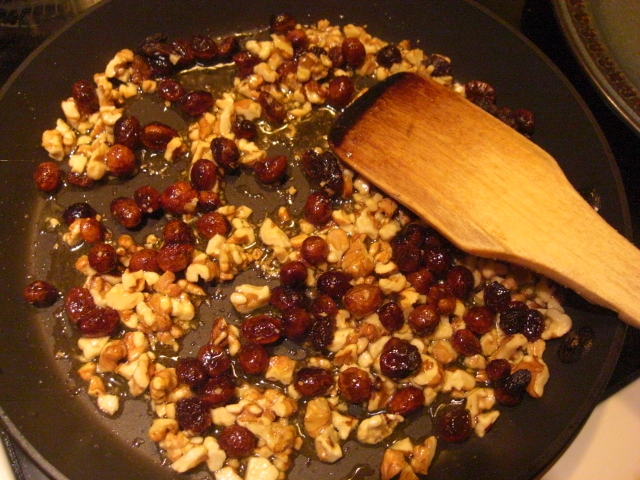 Bunch of walnuts, though. At first I was nervous about using walnuts, but then I remembered that sometimes people make pesto with walnuts and that baklava comes in pine nut and walnut varieties. Worth a try! Frozen vegetables aren’t as tasty as fresh ones. Here’s what I got this week. You can definitely tell how hot it’s been by the decrease in veggie production. The weather today seems better, so here’s hoping we’ll be rolling in tomatoes again soon. You know production is slow when the soap comes out. This bar’s scent is nice and not particularly feminine, so everyone in the house can use it. Handmade lye soap has the natural glycerin left in, and that can be good for your skin. Update: I used the soap last night and really like it! Be sure to wipe down your eggplant and turn the plastic bag inside out so they’ll keep longer. Don’t you love the chubby eggplant? He’s got great personality. Late summer suppers are so much fun – minimal cooking and molto fresh ingredients. I have two pints of fresh figs from today’s CSA delivery. 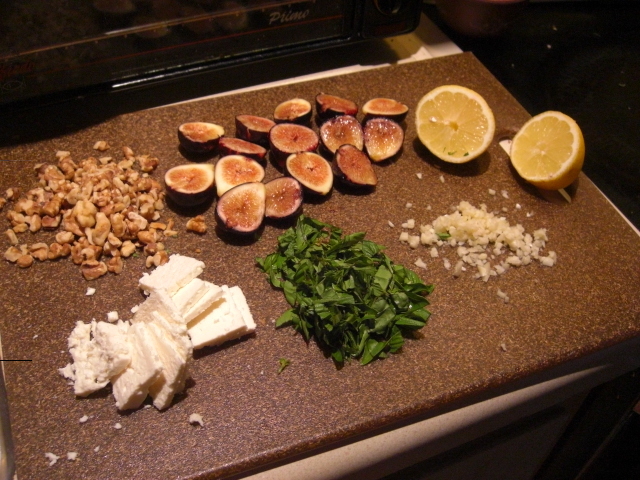 While I had planned for baked figs and goat cheese, feta was what was in the fridge. 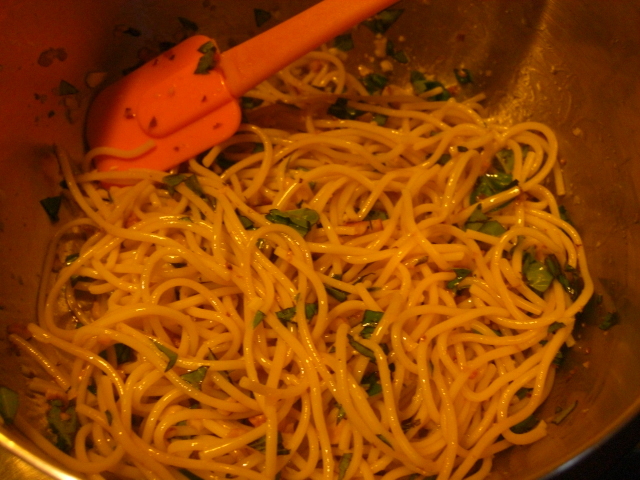 The other half of supper was pasta tossed in olive oil, lemon juice, toasted walnuts, chopped basil, and minced garlic. I baked the figs topped with feta at 350 degrees for about 10 minutes. For the pasta, I heated 3-4 tablespoons of olive oil on the stove over low heat while the figs baked. I had leftover spaghetti, so I heated that in the microwave and then mixed the pasta, warmed oil, and the rest of the ingredients in a bowl. The fresh minced garlic was a little strong for me, so Chris loved it. Next time, I’ll warm the garlic in the oil in the hopes that it will be a little milder. Overall, though, we were very pleased with our light, late summer supper and the bottle of Prosecco that went with it. I think I’ll bake the second pint of figs with cream cheese instead of feta, go overboard on the honey, and call it dessert.